Last year was Danang, Vietnam. And this year is... SHANGHAI! Well not exactly only Shanghai, we went to a few places in China. Well, because it's my first time travelling to a cold country, I seriously didn't know what to pack. So, I was a mess. I didn't bring any foundation or BB cream. So I only brought along with me concealer, loose powder, blusher, eye shadow, eye liner, eye brow pencil, contact lens (which ended up I didn't wear at all), and a brush for the blusher. Everyone kept reminding that it is important to keep hydrated. So I brought along whatever I have that is hydrating. Well, of cos I didn't bring the whole big bottle in the pictures, I packed them in smaller bottles bought from Daiso. So I brought, cleanser, toner, moisturizer, night cream, Laneige's water bank night mask, Bio-essense's Bio water, Hydrating sheet masks and last but not least, sun block. All these are what was in my handbag throughout the trip. 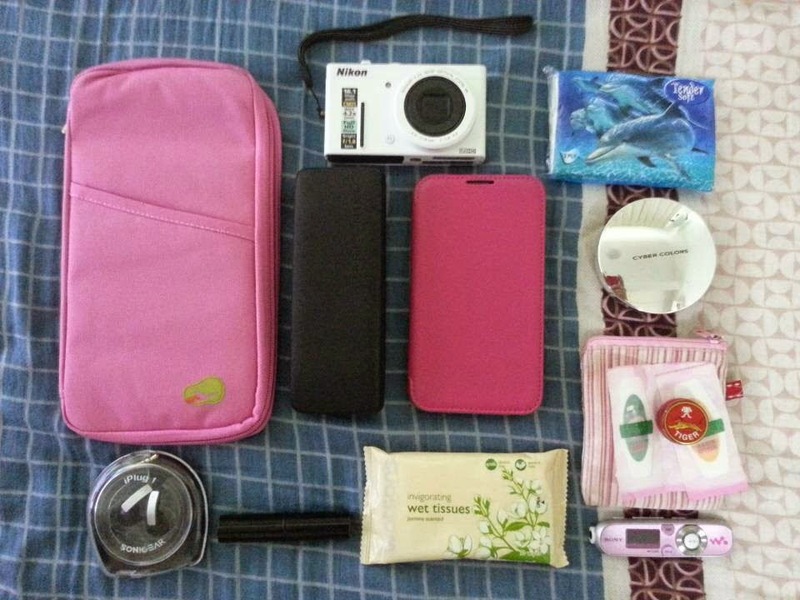 Passport holder, camera, specs box, mobile phone (d-uh), Loose powder, tissue, wet tissue, earphones, mp3, lip balm and my emergency pack (tiger balm and plasters). Well, passport checked, visa checked, everything else checked... OFF WE GO! The tour guide said that this pond is the first pond the Chinese start rearing fish for leisure and enjoy watching them. Look like four leaves clover? Night market. Nothing much here. This lunch place reminds me a little of the Brazilian grill in Damansara. I was too hungry so I didn't snap any of the grilled stuffs. Got BBQ sweet potato! Food here was OK.
Oh! I remember this place the most because of the lighting! This is outside of the Suzhou's Bird Nest. The lighting is damn pretty! This is some sort like a show they put up for the audience. One of the hotel's toilet. Damn canggih. But no wifi. Damn sad! This... I've climbed 290 steps! I didn't even climb our very own Batu Caves and I climbed here! To be honest, it's a pretty easy climb. the steps are not too high apart. Another night street thingie. It was Women's Day and it was DAMN packed! LIGHTS!!! LIGHTS!!! I WENT CRAZY! We were at the Shanghai Pearl Tower. I almost died. I am afraid of heights. Phobia!!! Nice statue eh? So romantic. Ouh! We were suppose to have dinner at one of the restaurants, but we arrived early. So we hung around at the waiting area. This puppy DAMN CHUBBY and DAMN CUTE! So geram!!! And... we go home... Love the sky color.